At the current rate of use–78 single family dwelling building permits have been issued so far this calendar year–that is about a 25-year supply of lots, even if no more lots are rezoned and platted for residential development. But the downzones may represent a trend. In 2009 the county downzoned a tract zoned for 257 residential units. In 2008, it downzoned a piece of property zoned for 72 residential lots. Allen Skinner, chief appraiser for the county, told me in an email message today that on Jan. 1, 2010, he had a count of 2,464 final platted vacant residential lots in the county. That was after the 2008 and 2009 downzones. Skinner said his figure for today is less exact, but he estimates the county now has more than 2,300 such platted residential lots. 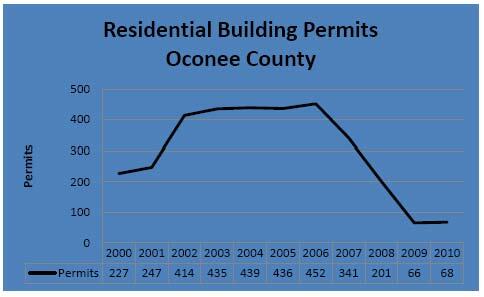 The county issued 452 residential building permits in 2006, according to county records from the Code Enforcement Office. That was up from 227 in 2000. 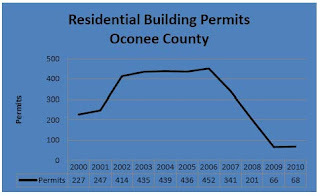 The number of permits declined to 341 in 2007 and then again to 201 in 2008. In 2009, the number of permits nosedived again to 66, and it was 68 a year later. The numbers are on a fiscal year basis, and the figure for July 1 of 2010 to June 30 of 2011–the 2011 fiscal year–has not yet been released. Linda Patterson in Code Enforcement earlier today gave me the figure of 78 for the 10 months of 2011. The two downzones on the agenda for the BOC meeting on Nov. 1 were approved by the Planning Commission at its Oct. 17 meeting. In both cases, the Planning Commission recommended that the BOC approve an agricultural classification for the land. Agricultural land is assessed at a lower value than is residential land, resulting in reduced taxes for the land owner. The larger of the two tracts–422 acres–is in the far south of the county south of Farmington and has frontage on U.S. 441 and on the Apalachee River. The property was rezoned from agricultural use to single-family residential subdivision with a minimum lot size of five acres late in 2005. Total number of lots was 79. Trees were cut for roadways on the property, but no further infrastructure was put into place. Farmland preservationist Russ Page had proposed that the frontage on the Apalachee become part of a River Walk from Heritage Park to a spot east of where U.S. 441 crosses the river. Those plans are in limbo. At the Planning Commission meeting on Oct. 19, Page spoke in favor of the downzone, and Planning Commission member George Rodrigues asked property owner Mike Jansen if he would consider the possibility of giving public access to the property along the river. Page met with Jansen after the meeting, and Page told me he was “optimistic” that something could be worked out. The second downzone was for 10 acres of land on the north side of Whippoorwill Road at the end of Turtle Pond Drive. Applicant Jeff Carter told the Planning Commission that the intent is to divide the 10 acres into two parcels and market them for single family residences, which would be allowed under the agricultural downzone. The property had been rezoned from agriculture to residential in 2008. A sanitary sewer pump station was built on the property in 2006, according to planning documents, but the remainder of the property was not developed. The easement for the sewage line will remain in place. The two downzones are small stuff in context. The Parkside residential development connecting with Hog Mountain Road and Mars Hill Road was approved for 810 residential lots in 2004, and the Westland development at Goat Farm Road and U.S. 78 was approved in 2003 with 430 lots. Both are undeveloped, with entrances blocked to the public. NOTE added 10/25/2011: The figures given me by Skinner are for platted lots, that is lots that have both been zoned for residential development and for which final plats have been filed with the county. B.R. White, Oconee County planning director, told me before I wrote this posting that his rough estimate was that somewhere near 5,000 lots have been rezoned for residential development. The county has no firm figure, he told me, so I used the figure from Skinner. In a conversation I had with him today (10/25/2011), White stood by his "educated guess" that the figure from Skinner covers only about half of the total number of zoned residential lots in the county. He said no records have ever been kept of the number. Parkside and most of Westland have not been platted, he said, nor was the land in either of the two downzones that will be before the BOC on Nov. 1. Why is the Whippoorwill property being considered? There are houses on all 3 sections of this subdivision. Why does this person get a break and not individual property owners? Won't this just bring in less taxes for the county, so you and I will have to pay more? If the county wants a river walk why didn't they purchase the property before another private party purchased it? Land isn't going to get any cheeper than it is now. If the county is serious about it, they need to break out the checkbook and stop depending on private citizens to allow access in their backyards or donate their property. Anonymous....This is not "The County" proposing this river walk. This is a citizen driven project, for citizens of Oconee and surrounding counties. These citizens are asking other citizens to allow this river walk, for all to enjoy. I bet you'd use it once we get it done won't you.